Thursday, 14th February 2013; 11:00 to 12:00 hrs. Abstract: Coral reefs support the livelihoods, and contribute to the social identity, of millions of people across the world. 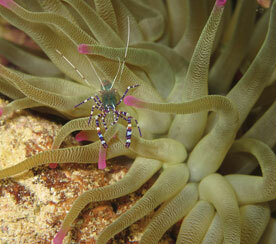 However, many coral reef ecosystems are in decline. Developing management that is likely to succeed and endure is complex because reefs have both social and ecological dimensions that are intrinsically linked (what is often referred to as a social-ecological system). Yet management tends to focus on either the social or the ecological system, rarely integrating both. To help fill this gap, I develop a framework that integrates ecosystem response with an understanding of human behaviour. I apply this framework to two countries in the western Indian Ocean (Kenya, and Seychelles), focusing on three key components of coral reef social-ecological systems: 1) fisheries management; 2) ecosystem services, and; 3) social context. First, I assess the efficacy of current management by examining how the yield and composition of landed catch is related to gear restrictions and closed areas. I find that yields increase over time where there is compliance with any of the types of management. These increases are driven by the tendency of legal gears to select species with faster turn over times. Second, I adopt an ecosystem services approach to examine if different types of management are related to how people value ecosystem services. I find, increasingly centralised forms of management are associated with greater total values. However, these larger total values are associated with lower cultural values; trade-offs that are likely to result from global market forces. Finally, I explore how aspects of the social context interact with ecosystem service values to influence the way individuals are likely to behave. I find individuals who prioritise cultural values are more likely to take action when a norm is broken and tend to support one another. Individuals who prioritise fishery values, have higher levels of dependence and are less likely to come together to manage their resources. By integrating fisheries management, ecosystem services, and social context I have developed an understanding of which management tools are most effective, how different aspects of the ecosystem benefit different sectors of society, and how management can be targeted to fit the socio-cultural context. Biography: Christina is an interdisciplinary social scientist working to develop sustainable, equitable, and efficient approaches to managing coastal resources. Christina worked as a fisheries scientist for Dr T.R. McClanahan in Kenya and completed her master’s degree at Newcastle University in the UK. 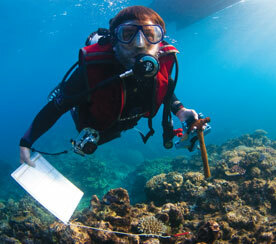 Christina is currently completing a PhD at the ARC Centre of Excellence for Coral Reef Studies, supervised by Prof T.P. Hughes, Dr J.E. Cinner, and Prof R. Pressey with co-supervision from Prof N. Stoeckl. Christina’s PhD research integrates theory and methods from economics, psychology, political science, and fisheries science to examine the way people’s values relate to and change, depending on their social context.